How do you shape a first draft into a finished novel? Learn new strategies for analyzing what you’ve written, developing a revision plan, shaping character arcs, and improving your sentence-level writing. Attendees will walk away with helpful worksheets and specific tools to break the overwhelming task of revision down into manageable pieces, start to finish. 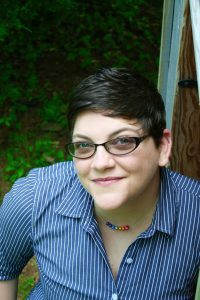 Megan K. England is an author and YA librarian living in the mountainy parts of Virginia. When she’s not writing or librarianing, Megan can be found drowning in fandom, rolling dice at the gaming table, going to conventions, climbing on things in the woods, feeding her video game addiction, or improvising truly terrible songs about her dogs. She loves Star Wars with a desperate, heedless passion. It’s best if you never speak of Sherlock Holmes in her presence. You’ll regret it. Her debut YA space opera, THE DISASTERS, will be out in Fall 2018 from HarperCollins Children’s. Hi! Will we be getting any other confirmation other than the receipt? Thanks! Poppy, if you’re worried, fill out the contact page and ask me to confirm it. It’s the best way to make sure it went through. Thank you for supporting Pitch Wars.